Q. Where is the only place to find answers on 1,263 questions about Montana? A. Click here! This book is your personal compendium of the most incredible, unbelievable, wild, weird, arcane, fun, fascinating, and true facts about Montana. Great easy reading with a game at the end of each section! Ever wonder if there are any states with more pick-up trucks per capita than Montana? Curious about how many tourists are injured by bison in a typical year in Yellowstone? Would you like to know what Montana county has the highest ratio of men to women (139 males for every 100 females) or what the largest rodent in the state is? * Find out in Janet Spencer’s book “Montana Trivia” published by Riverbend Publishing of Helena. To order from Amazon, click here. “Montana Trivia” is like the game of Trivial Pursuit in the form of a book: 1,263 questions and answers in six different categories: Geography, History, Entertainment, Arts & Literature, Sports & Leisure, and Science & Nature. Discover which county is our largest-- the size of the states of Connecticut and Rhode Island combined. Find out where you can find the fossilized gizzard stones of a dinosaur on display. Learn where there’s a bell that is rung only once per year. * The glove box for entertainment during drives! * Keeping in the camping gear for campfire quizzes! * Tourists & natives alike! * The perfect gift for the know-it-all on your gift list! Only two states have more pick-ups per capita than Montana: North and South Dakota. An average of five tourists are injured by bison each year in Yellowstone. Powell County, with Deerlodge [State Pen] as the county seat, has the greatest ratio of men to women. Cascade County [Malmstrom AFB] comes in second. The beaver at 90 lbs. is our largest rodent, followed by the porcupine. Our largest county is Beaverhead, at 5,500 square miles. The Harlowton museum displays the fossilized gizzard stones of a dinosaur. The Montana Statehood Centennial Bell in the Capitol is rung once each year, on November 8 at 10:40 a.m. to commemorate the moment Pres. Harrison signed the paper making Montana a state. 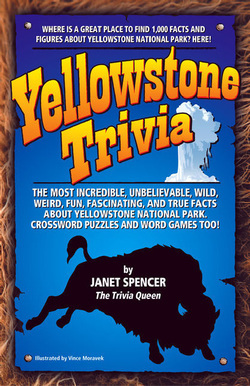 Trivia Queen Janet Spencer creates a fun book with the most incredible, unbelievable, wild, weird, fascinating, and true facts about Yellowstone National Park. Great for curious kids, inquisitive campers, inquiring hikers, and smart travelers! Published by Riverbend Publishing. To order from Amazon.com click here. This book, like Yellowstone National Park itself, is full of superlatives. By the time you finish reading this book, you will know all about such Yellowstone oddities as the strangest creek and the weirdest river; a man-made geyser and an underwater geyser; the world’s worst cup of tea and the most outrageous garbage can. Hear the story of the world’s most damaging cigarette break. Find out about the day the park closed down. Learn which activity – which virtually 100% of park visitors participate in – kills more tourists than any other activity. Between the covers of this book, you’ll find everything from a pivotal stagecoach robbery to an inconvenient grave and an uppity maintenance man. From the smallest geyser to the biggest hot spring, from the deepest lake to the sharpest stone, Yellowstone Trivia tells you all about the hottest, the coldest; the newest, the oldest; the highest and the lowest. Full of freaky facts, funky figures, and fabulous fascination, this book is fun-tastic and fun-forgettable. Betty in the Sky with a Suitcase is a wildly popular podcast about airline travel by real life flight attendant Betty, who shares funny stories from pilots, flight controllers, ground crew, passengers, and fellow flight attendants and is listened to by hundreds of thousands of Betty fans around the world. Now, by popular demand, here is the best of Betty in a book in what may be the world's first podcast-turned-book, or pook. It's a wonderful way to be entertained in the airport, on a plane, at home, and anywhere you want a good laugh. Interspersed with trivia bits, quizzes, quotes, and jokes from Trivia Queen Janet Spencer, this book is an unforgettable experience. Visit Betty's podcast website by clicking here.